When I discovered Ron Miscavige, the musician father of Scientology fuhrer David, was coming out with a tell-all memoir about his progeny’s crimes against humanity, I got excited. I’ve read a lot of tell-alls about Scientology, but this promised to be different. Ron Miscavige is no garden-variety ex-Scientologist; he is the man who fathered the glowering face of Scientology, then lived long enough to see the son he once adored destroy the religious faith he devoted much of his life to. How could the story of Ron Miscavige’s darling boy devolving into evil incarnate be anything less than captivating? Sure enough, the book, boldly titled Ruthless, gets off to a suitably compelling start with an account of how David had his father followed after he left Scientology. He even instructed the pair of snoops he hired to shadow his father not to intervene when they thought the old man was having a heart attack. Alas, that opening anecdote has a vividness and a specificity that the rest of the book fatally lacks. I wondered why this book hadn’t gotten more attention, given its author’s relationship with the sinister head of Scientology. Reading Ruthless, I quickly got my answer. Despite a riveting opening, Ruthless is simply not a very good book. Much of the blame goes to ghostwriter Dan Koon. A ghostwriter’s job is to take their subject and collaborator’s raw material of life, word, and experiences and transform them into a compelling narrative. Ruthless, however, feels like Koon sat his subject down for a couple of days and more or less just transcribed what he said, then sent in the results as the finished manuscript. The book is full of ineloquent, fuzzy, and bland language—with references to “guys” and “stuff”—that’s maddeningly devoid of psychological insight, into either the author or his son. Part of a ghostwriter’s job entails capturing and reproducing a co-author’s voice, and judging by Ruthless, that voice is grouchy, hard-assed, and not exactly overflowing with empathy or compassion. David comes off terribly, of course, but so does his father. But somehow Ron fails to see the link between his son growing up in a household where his father hit his mother, and tried to cure his son of asthma by forcing him to lift weights whenever he felt an attack coming on, and his son growing up to be mean and cold to sociopathic extremes. One of the many heartbreaking elements of Ruthless is that the author doesn’t seem to have any special insight into the psyche of the controversial head of Scientology. The portrait of David Miscavige that emerged in Lawrence Wright’s Going Clear was far more nuanced, exhaustive, and compelling, but Wright is a great writer. Ron Miscavige obviously can’t compete on a literary level, but ideally he would make up in access what he lacks in eloquence. That makes it even more frustrating that so much of the information in Ruthless comes secondhand. The author is continually referencing things he’s heard about David, or that he read about David later on, rather than reporting about his own relationship with his son. But Ron was not part of his son’s inner circle, or a man David confided in. On the contrary, David seemed to make a big show of treating his father as shabbily as possible to avoid allegations of nepotism, but also because he’s just an awful, awful human being, and his own family isn’t at all immune to his galloping cruelty. For the first part of their lives together, before David began his rapid ascent to ultimate power, Ron and David Miscavige inhabited the role of father and son. Once David became L. Ron Hubbard’s heir, their relationship shifted from father-son to bullied cult member-cult leader. So why did this young man turn into a monster? Ron’s answer is as predictable as it is banal. To recycle the old cliché, the author argues that absolute power corrupted absolutely. Like many former Scientologists, Miscavige still holds many elements of L. Ron Hubbard’s teaching in high regard even as he views the organization itself as broken and toxic beyond repair. While disillusioned with Hubbard, Ron also holds his son responsible for corrupting something with the potential to genuinely help society. 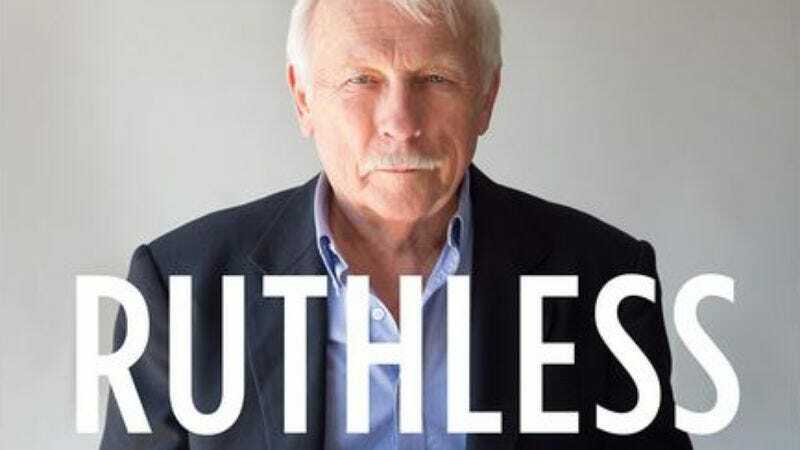 Reading Ruthless, I found myself surprised that someone like Ron Miscavige would be attracted to Scientology in the first place. He does not seem like the kind of spiritual seeker who might come to Scientology after first experimenting with drugs or Eastern mysticism or other eccentric spiritual paths like EST. The ex-Marine seems like the kind of hard-assed, macho dude who would sneer at something like Scientology. He initially saw Scientology as a self-help system that paid huge instant dividends in his personal and professional life, rather than a money- and power-hungry cult that would eventually take over not only his own life, but his family’s life as well. Ron became deeply involved in Scientology because it worked wonderfully for him at the beginning. After a certain point, like other Scientologists, he stayed in because he had devoted so much of his life to spreading its gospel. And a man as proud as Ron would understandably have a hard time conceding that he’d wasted his life working for an organization that wasn’t just inhumane but genuinely cruel. Ron’s time in Scientology wasn’t entirely devoid of positive aspects. His son’s best buddy Tom Cruise sometimes sent him fancy gifts. In his capacity as a professional musician in the Scientology fold, Ron worked with, or met a lot of superstar Scientologists he invariably describes as great, like Isaac Hayes, Edgar Winter, Lisa Marie Presley, and John Travolta. David once gave his father $100,000, although it seem like a pragmatic gesture to ensure his father’s silence and cooperation rather than a humanitarian effort. Eventually, an elderly Ron leaves Scientology along with his second wife, but has a much harder time escaping the long shadow of Scientology and his son’s clutches. Still, Ruthless overall is spectacularly unedifying and surprisingly dull. I suspect that it will be read primarily by Scientology obsessives like myself, who pride themselves on reading everything Scientology-related that wasn’t written by L. Ron Hubbard. We’re also the demographic most likely to be disappointed by revelations that might have qualified as shocking long ago but now feel like lukewarm leftovers. Ron is appropriately horrified by abusive, psychotic Scientology practices like “disconnection” (forcing Scientologists to cut themselves off completely from someone labeled a “suppressive person,” even if they’re a close family member) or throwing people overboard on seagoing vessels for minor transgressions. But these awful practices by this point are well-known facets of the controversial church’s history. The wounded beast that is Scientology has responded, with deadening predictability, to Ron’s book with an entire website, ronmiscavigebook.com, painting Ron as a vicious wife-beater and all-around degenerate shamefully trying to impugn the name of his saintly son. It is a depressing place to spend any time and just makes it seem like both parties have a lot to be ashamed of. On both sides, it’s like overhearing a sad family argument that reflects badly on everyone involved. Before reading Ruthless I thought I had a bottomless appetite for Scientology tell-alls, but Miscavige’s thoroughly disappointing memoir suggests that maybe I’ve reached my limit. So I promise not to read or write about any more Scientology tell-alls in this column. Until, of course, the next one comes out.